This tasty stew is comforting and filling. 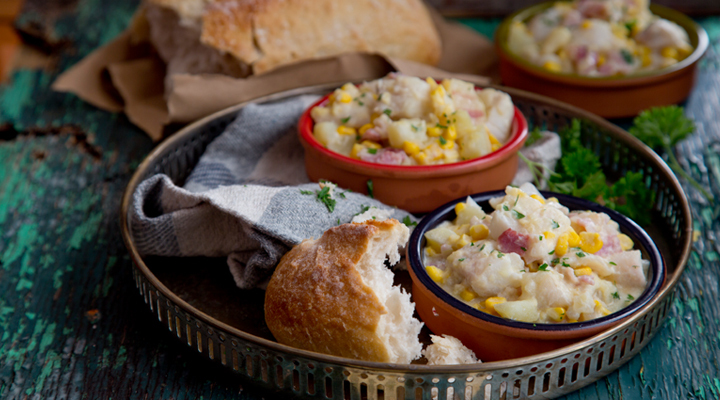 The corn gives it a lovely natural sweetness that is sure to lure the kids in! If you can't get hold of fresh corncobs, use 250g of tinned or frozen corn kernels instead. Try this with any white fish like hake or cod instead of haddock. If using plaice or whiting, then roll strips of the fillets into Swiss rolls before popping them into the stew so they don't break up too much. Prawns would work really well in this too. In fact, a selection of different fish and shellfish would be dreamy! Melt the butter in a large pan. Add the potatoes, onion and bacon and gently fry for 4 to 5 minutes, until beginning to soften. Cut the corn kernels from the cobs and add them to the pan along with the garlic, frying for 1 minute. Add the stock and bay leaf and bring to the boil. Reduce to simmer gently for 20 minutes, until the potatoes and corn are just tender. Gently stir in the crème fraîche, then add the haddock. Simmer for a further 4 minutes, until the fish is cooked through. Stir in the parsley, season to taste and serve at once with crusty bread. Tip: This is ideal for home freezing or to serve the next day in a lunchbox soup flask. Omit the crème fraîche for a dairy-free version.